If you're a guy who dares to tread where snakes live, you could use a tall Snakeproof waterproof boot. The Rocky® Retraction Waterproof Side-Zip Snake Boot is designed to keep you safe, dry and comfortable. With this boot, you're protected from most bites from venomous snakes inhabiting North America. 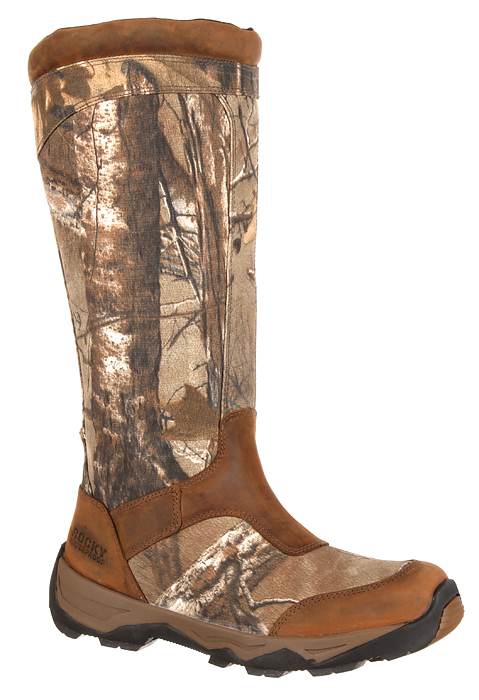 The boot is 17 inches of full-grain leather and 900-denier nylon in Realtree Xtra® camouflage. The snakeguard material keeps you safe from snakes, while the camo is a great choice for your hunting boot. The material also is tough and withstands tears and abrasions. So that you can go where the day takes you, this also is a waterproof boot. Walk through mud, water, muck and mire. You're good to go if you're wearing this waterproof snake boot. It's made with Rocky Waterproof construction, so the waterproofing is guaranteed. To make getting into your camo snake boot quick and easy, there's a side zipper on the inside of the footwear. Also inside are plenty of comfort features. The EnergyBed footbed with memory foam returns energy with each step and it forms to your foot. There's a nylon shank for arch support. A moisture-wicking lining fights sweat. Flexible strobel/ cement construction attaches the upper to a comfortable rubber outsole that makes a great platform for this men's boot.